There are lots of creative people in this forum so lets see what you got. Doesn't matter if it's a trap,spinner or knock down or how ugly you may think it looks,I would like to see it. I don't have anything new right now so I will post my target box set up and my bell ringer to start off. The front of the bell target is on the right in the second picture. I am sure this has been done before. I had a fairly big collection of beer bottle caps and empty 12g CO2 cartridges. A short deck screw holds the cap on. I made about 20 to shoot at the cottage last weekend. Heavy enough to not blow over in the wind, but still give a satisfying spinning tumble when hit. What's the material thickness for 12 ft/lb rifle? I just finished this,it's made from 2 Walmart cow bells that cost $7.00 each. 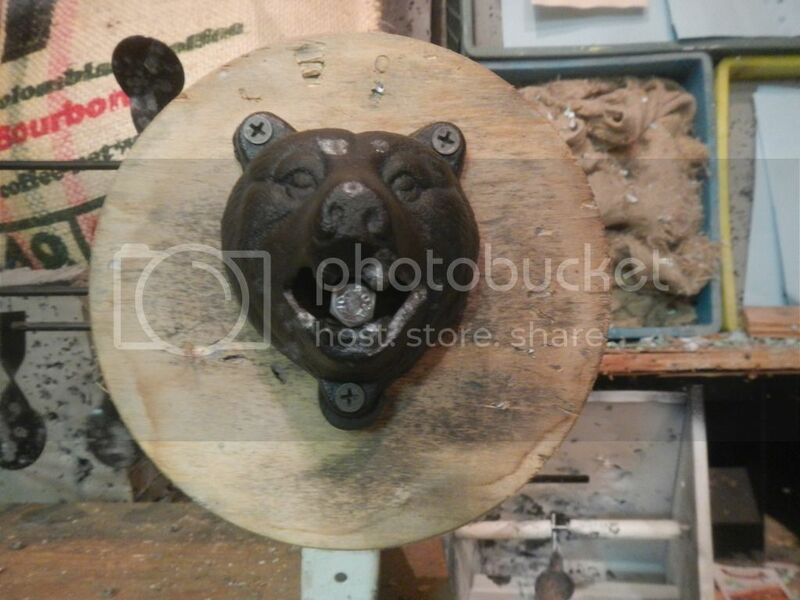 This is a bear bottle opener on sale in a local tourist shop for five bucks.the mouth holds a paint ball or turned into a bell target. I made this UHMW polyethylene 'soap bar' rocking target this past spring and have left it up on a rocky hillside at the archery range which serves as our once-a-month HFT range. It's about 50 metres from our usual firing line for plinking/sighting-in. For the guys who are decent shots it's no challenge at all from a rest, but I like shooting at it standing with no support. Makes it fun. This past Sunday I was able to hit it about half the time I tried. The plastic is about 6cm x 10cm. Waggles nicely when hit at lower power, spins like mad with a hit on the bottom half with anything over about 20fpe. This animated GIF was made in my workshop using a sub-3fpe Webley Junior however, from close range. The pellet bounced downward. They always do. Unfortunately. As if one shoots at it from closer than about 25 metres there's a tendency for it to shoot back. It's mounted with a hole drilled through this very durable plastic on a piece of 3/8" steel rod bent down on either side. For the next time I get out to Mission (seems unlikely for November as Mike and Rick aren't going to make it and I don't drive) I've drilled a hole in the threaded end of a camping size propane bottle and stuck a galvanized steel cable through that, fixing it with aluminum cable crimps so there's a loop at the end of about a 60cm length. Should swing nicely, making for a fun moving target after a hit when hung out at 40+ metres. Folks can practice their follow-up shots on moving 'prey.' No pics of that, but I just made sure it was completely emptied then drilled it, connected the cable, then spray bombed it with some old yellow enamel so it's bright. It'll make a nice *CLANG* as well. ok. so I thought I was gonna be a smart buttock and make one of these; and just post pics and say how good it worked; BUT i can't find anything anywhere that will work. i don't know what that shaft is called . maybe a pivot shaft. when you hit the target it should go down and the one on the opposite side will pop up. it must have some kind of gears or something inside i would guess. if anyone knows what i can get to do this please let me know. thanks. if anyone has made one of these maybe can help me out too. thanks a lot. wood, screws, duct seal and a few handles let over from a reno. stupid internet. in my search of targets I'd like to try and make; I get my mind going on one and then I find another one. these aren't made yet and probly won't be attempted until spring. I found a new one I thought looks pretty cool; the tombstone shooting rack; I didn't get a reply about that groundhog flopper target ; so I'll try again; if anyone knows what to use as a shaft to make it pop up when you shoot the other one down I'd like to know. thanks. This is one of a pair of tin men my wife got at a craft sale years ago.The other one is painted like a Toronto Maple Leaf and wasn't worthy of a picture. .They are off limits to me ever since she heard a bb hit one. I thought these would be neat targets for people that can shoot long range. The second picture is the new Pepsi cans we just got. Need I say more. Nice but you missed the bells completely and only hit the little triangles, ha ha..